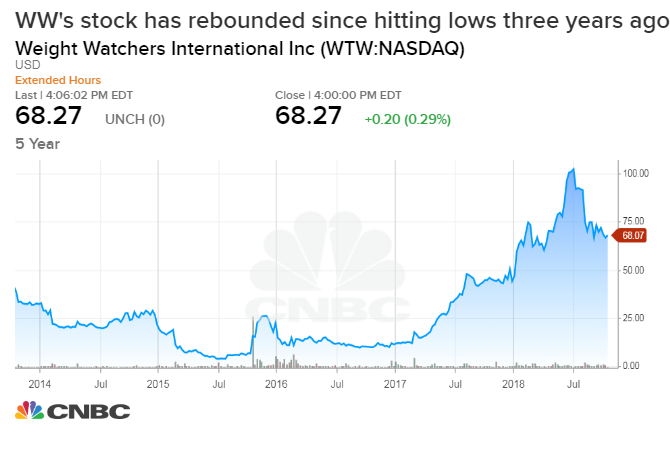 With consumers shunning diets for wellness, Weight Watchers rebranded to WW in September. Its revenue, which climbed almost every year since its 2001 IPO, peaked in 2012 at $1.83 billion. Board member Oprah Winfrey helped bring in CEO Mindy Grossman, who must balance WW's new vision with Weight Watchers' legacy as a diet giant. WW's Connect App allows people to track what they're eating and drinking and the points associated with them. Oprah Winfrey invested in WW in 2015 and joined the company's board of directors. Jean Nidetch founded Weight Watchers International in 1963. She wanted to combine community with nutrition to help people lose weight. WW celebrated its transformation from Weight Watchers in October at the Barclays Center in Brooklyn, New York, ahead of the Bruno Mars concert.